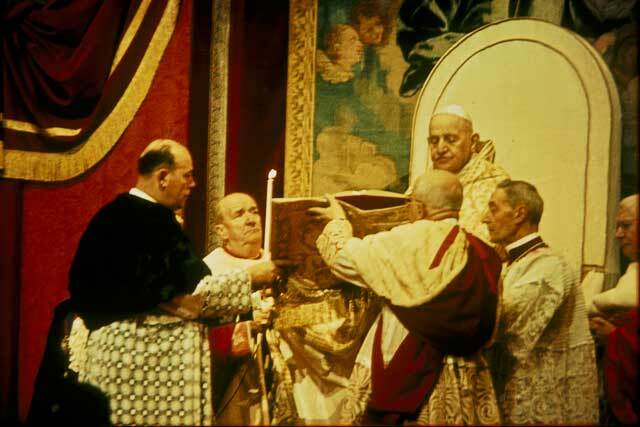 Below is an extract from the text of the official Decree of Canonisation issued by Pope John XXIII during the solemn ceremony of canonisation of Peter Julian Eymard, Anthony Mary Pucci and Francis Mary of Camporosso, held at St Peter’s Basilica on 9 December 1962. For the honour of the Holy and undivided Trinity; for the exaltation of the Catholic Faith and the increase of the Christian religion: by the authority of Our Lord Jesus Christ, of the Holy Apostles Peter and Paul, and by Our own authority: having maturely weighed the matter and often besought the divine aid, and with the advice of Our Venerable Brethren – the Cardinals, Patriarchs, Archbishops and Bishops of the Holy Roman Church, abiding in Rome: We decree and define that Blessed Peter Julian Eymard, Blessed Antonio Maria Pucci, and Blessed Francesco of Camporosso, Confessors, are Saints. We determine (statuentes) that, each year on the day of their birth – to heavenly glory – viz, *August 1 for Peter Julian, January 12 for Antonio Maria, and September 17 for Francesco – they are to be honoured among the Holy Confessors with holy devotion. In the Name of the †Father, and of the †Son, and of the †Holy Spirit.